Nanaʼs Green Tea Café now offers a special lunch set at an affordable price of $13.90 with a whole list of choices to choose from, give yourself a break and make your way to Nanaʼs Green Tea Café for lunch now. 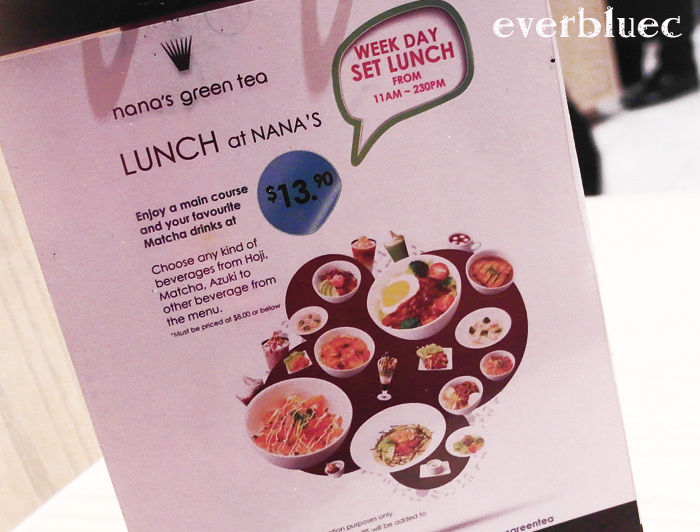 Nanaʼs Green Tea Café offers lunch featuring a complimentary drink and a main course of your choice. Consumers gets to choose any kind of beverages below $8.00, ranging from Hoji, Matcha, Azuki to other beverages from the menu. Signature dishes including Singaporeanʼs favourite Salmon Don, Locomoko Don and Mushi-Dori Goma Dare Udon will also be available. This lunch set is available only from Mondays to Fridays, 11.00AM to 2.30PM. Beef patty served over warm Japanese rice garnished with lettuce, tomato, broccoli and an egg sunny side up. Crispy deep-fried chicken fillet served over warm Japanese rice with lettuce, tomato, corn, spring onion garnish with a side of tartar sauce. This dish reminds of our home version of Lo hei (we like always have salmon with the sesame, fish sauce dressing .. kinda like the yu shen sauce we have at the porriage store).. the salmon is very juicey, thick and fresh! This has is really good too.. the tuna is really thick, juicy and yummy, the sauce has alittle bit of the nutty flavour, kinda like the raw sesame or some nut oil beside sesame oil! But this was a little bit too salty! I wanna go back there again to try their hoji cha~ and some other signatue dish!!!!! dealing with ʻʻMatchaʼʼ, green powdered tea. "Nana's Green Tea" gained popularity and became known as the ʻJapanese Starbucksʼ where tea drinking is a culture. Nanaʼs Green Tea Cafe was also awarded the No.1 brand among Japanese cafe. All green tea leaves served in the Café are imported from Kyoto only, which is the most famous production center of ʻʻMatchaʼʼ, aiming at delivering genuine Japanese taste and health to modern people. Our aim is to introduce the finest Japanese food culture and tradition to the world and enrich people's life. The logo mark is designed in the motif of ʻCha-senʼ, a tea stirrer. Combined with the idea of ʻnanahaʼ, which means seven leaves. From this, the logo is thus named ʻnana-senʼ. Thanks Publicist PR Consultants for the invitation.